The group is excited to announce its 2017 homecoming – Christian Music Nights. 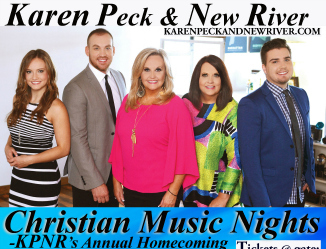 Karen Peck & New River will continue its annual tradition of hosting Christian Music Nights on Father’s Day weekend. This year it will fall on Friday, June 16, 2017 and Saturday, June 17, 2017 and take place at New River Park in Dahlonega, Georgia.